So you have found the perfect mattress, the next thing to do is make sure that you protect it with a high quality waterproof mattress protector. Adding a mattress protector is a critical step to maintaining the feel, support, and aesthetic of your new mattress. A waterproof mattress protector, also sometimes referred to as a waterproof mattress pad or waterproof mattress cover, prevents accidental spills, stains or soiled areas from penetrating into the mattress. It only takes one small spill to be glad that you are using a protector! In some cases, an unfortunate spill can also void mattress warranties, making a waterproof mattress pad even more critical. FAQ: Do you need a mattress protector or a mattress pad? Do I Need a Waterproof Mattress Protector? There are many mattress protectors on the market today that are designed to protect your mattress. While many of these may protect against dust mites, dirt, and other allergens, it is important to invest in one that is also waterproof. Accidents happen. Spills happen. While you can’t be there to protect your mattress 24/7, a waterproof mattress protector can be. Many waterproof mattress covers are designed to prevent and contain liquid penetration. This is great for stains that you might not catch immediately, like bed wetting or water spills. A low quality waterproof mattress protector will be noisy and have that iconic plastic feeling, like a cheap raincoat. A high quality waterproof mattress protector will feel soft to the touch. You may not even think that it is actually waterproof, but the proof is in the detailed construction of the product. Beyond preventing catastrophic liquid spills, a waterproof mattress protector will also help prevent sweat and oils from your body from penetrating the mattress. This will help to further extend the life of your mattress. Many waterproof mattress pads are made from a two-part structure that balances comfort and durability. The top layer is typically a comfortable material that is soft to the touch, almost mimicking the feeling of an actual bed sheet. Sometimes that may mean a cotton terry cloth material. In other products, it could be a knit cotton fabric. Although it may seem counter-intuitive, the main job of this soft top layer is to actually soak up the spill into the protector as soon as it happens. This prevents excessive spread across the protector and minimizes the risk of the spill penetrating into the mattress. The second layer is the waterproof protective layer. This layer locks the spill into the core of the mattress protector without allowing it to seep through into the actual mattress. This can be a polyurethane, vinyl, or special patented technology, unique to each manufacturer. 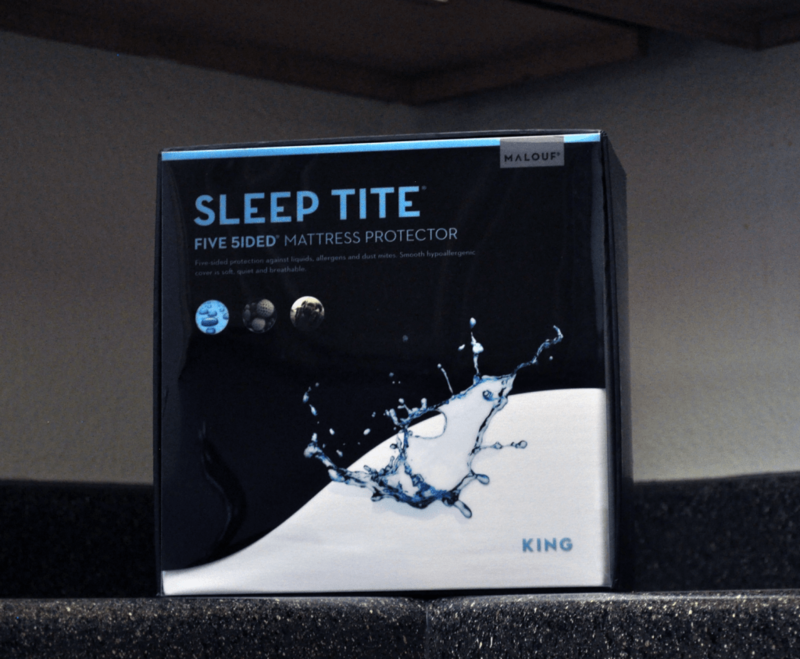 It is the combination of these two layers working together that provides a leak-proof seal between the protector and your mattress while still allowing air to circulate. 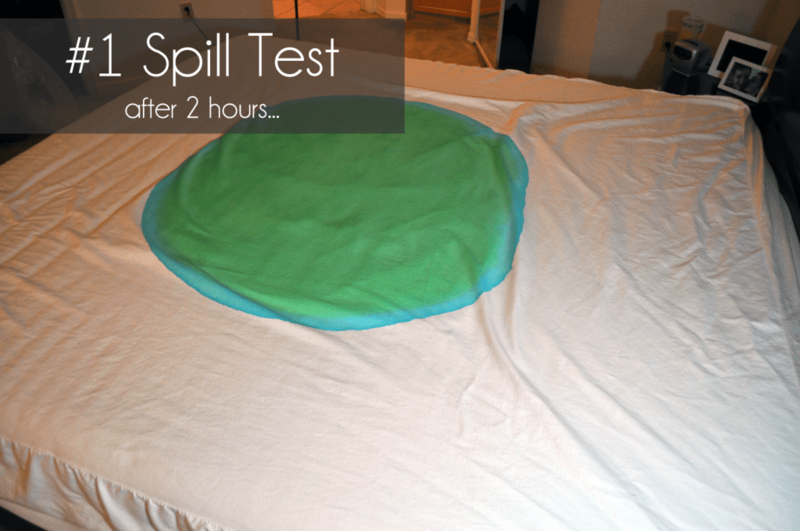 Naturepedic Spill test, this image was taken several hours into the test. At this point the liquid is fully absorbed. A quality waterproof mattress protector will be able to handle maximum moisture, while being virtually invisible to the sleeper. It should be able to maintain the original feel of the mattress, avoid heat build-up and refrain from loud noises that could disrupt sleepers throughout the night. 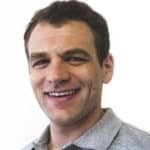 It should also be able to provide relief from bed allergens or asthma symptoms without feeling like a scratchy plastic, common to many cheap waterproof mattress covers. The mattress cover will be installed just above the mattress, but below the fitted sheet. This protector is the last line of defense against accidental spills on your mattress. When researching the perfect waterproof mattress pad, be sure to think about how you’ll be using it. What type of sleeper are you? Are you more prone to spills or accidents in certain areas of the bed? For example, do you eat or drink on the edge? 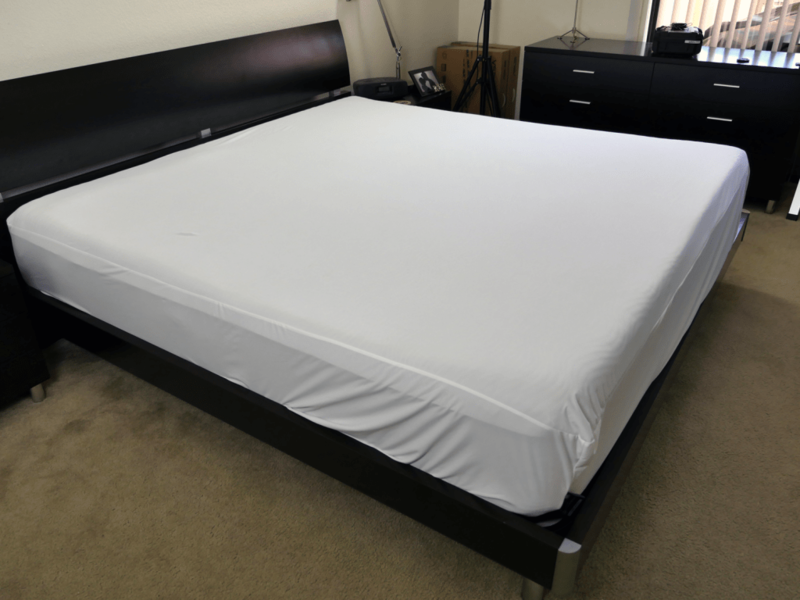 Even for the best waterproof mattress protectors, the edge of the bed can be a danger zone. In many cases, the sides of the mattress protectors might use a different material than what is used for the top of the protector. In many of our reviews of waterproof mattress protectors, the rate of leakage was greater once the spill reached the edge of the bed. 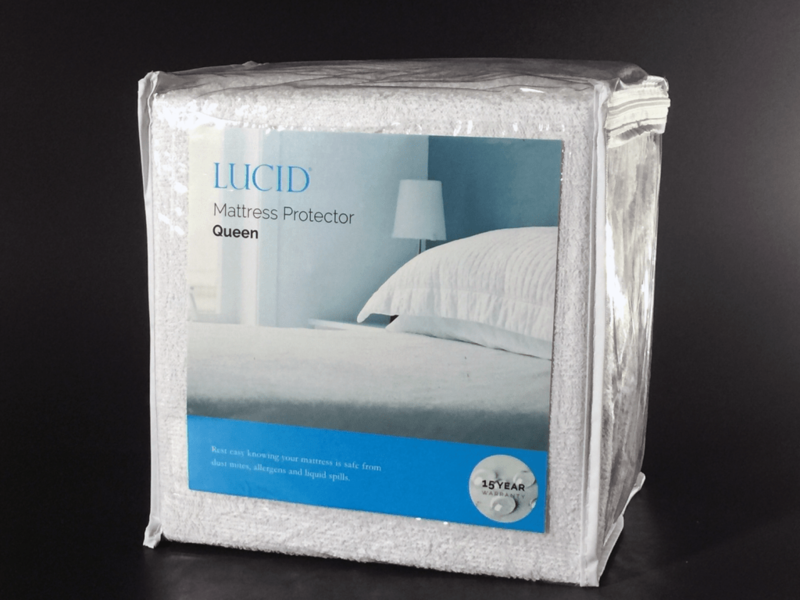 The Lucid mattress protector is a good example of a protector that has good top level coverage, but no protection along the sides. If you have kids, pets, or eat / drink in bed, avoid this. Otherwise, this could be an okay choice for you. Malouf’s 5-sided protector offers protector along the top and bottom of the mattress. Lastly, you might also consider a full waterproof encasement mattress protector. These zip along the bottom of the mattress, completely encapsulating the mattress from outside dirt, damage, and of course, spills. Whether your mattress is top-of-the-line or at the end of its rope, it is important to invest in a waterproof mattress protector. These special covers can prolong the lifespan of your mattress by preventing the spread of liquid spills, sweat, body oils, dust mites, pet dander, or other bedroom allergens. Contrary to the typical plastic feel of a cheap waterproof mattress protector, a high quality one will feel almost like a fitted sheet and be virtually invisible to the sleeper. A good waterproof mattress pad will not retain excessive heat, allow the transfer of spills or change the original feel of the actual mattress. Waterproof, encasement protection, bed bug prevention $75 Coming Soon! Waterproof, encasement protection, bed bug prevention $49 Coming Soon!